Water damage is the second largest type of insurance claim. According to the International Standards Organization (ISO), the percentage of water damage claims is increasing. People have many questions about what a home insurance policy covers and why ‘gradual damage’ is not covered. Homeowner’s insurance often covers losses due to weather variations such as water damage, spring thaw, or winter storms. In 2015, winter storms caused about $3.5 billion in losses that were insured. Munich Re predicts that weather pattern changes will bring harsh weather conditions to areas traditionally not seeing heavy winter activity. Winter storm claims are likely to rise. Fortunately, damage caused by a cold snap, spring thaw, or winter snow is cause for claims by insured homeowners. There are different types of policies, risk factors and damages that arise from weather that can be covered by insurance. Homeowners may be able to obtain help and compensation. Standard insurance covers most of these weather-related damages. The major exception is flood damage. Standard homeowners insurance in the U.S. usually does not cover flood damage. We think about damage risks to our homes, but there are other significant risks if a property is not maintained or as the result of weather. You can be held responsible if other people are injured on your property. Homeowners insurance covers liability, but there are of course exclusions and unusual circumstances. The first step to take is contacting the insurance company, even if you feel the injury is not your fault. You will be advised what to do next. The insurance company will get involved to help. Insurance companies help with legal aspects and defense costs if necessary as part of liability coverage. Take advantage of the service. Your insurance premiums pay for it. Insurance policies are contracts entered into with an insurance company. You agree to keep the company informed of circumstances that could impact liability. Trying to solve issues on your own may create problems with your coverage. An insurance representative is in position to explain your coverage and what will be done to help in a situation. • Injury to others on your property such as a tree branch falling and hitting someone. • A personal injury such as someone slipping on ice on a walkway – You are required to do your best to keep sidewalks clear of ice and snow to avoid harm to anyone. • Ice or snow from the roof suddenly crashes on a car that is parked or someone walking along your property is injured – It is important to be aware of accumulation on a roof and take measures to prevent accidents following a storm. Inform the insurance company as soon as damage or injury is noticed. Insurance does not cover the gradual damage. Postponing action could be costly and cause further damage that is not covered if a claim is denied. 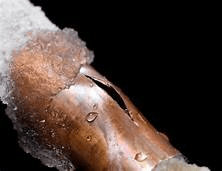 When water is trapped in pipes, and the temperature falls below freezing, frozen water expands and causes a hole in the pipe or breaks a pipe at its seams. If not caught in time, the water begins to thaw and can cause massive loss and damage. Not all homeowner policies are alike. Each property owner needs to check for coverage by calling the insurance agent or reading the policy. In general, burst pipe water damage is covered by standard homeowner policies. Outside pipes that burst or cause damage should also be included. You have to demonstrate the damage came from the burst pipe. If poor drainage is the insurance adjuster’s conclusion, the claim will likely be denied. A water claim could be rejected if the adjuster concludes you are responsible for a pipe bursting. Most pipes burst because they freeze. Maintaining a specific temperature in a home may be a requirement. Other policies require a working alarm system that sends an alarm to a monitoring system if the heat is off. Failure to maintain policy requirements may result in a claim denial. If a home is unheated when the weather is freezing, the adjuster can cite negligence as the reason for denying the claim. There can be conflicting information about payment for the repair of the pipe. An insurance company that pays for water damage as the result of a broken pipe may refuse payment to repair the pipe. Insurance does not cover normal wear-and-tear. A pipe that bursts because it is corroded or old, or was attached to a malfunctioning appliance might be seen as usual wear-and-tear. How you report water damage claims to an insurance company can make a huge difference. The word ‘flood’ should not be used under any circumstances. Insurance companies have a specific definition of flood. Using the term casually when talking to an agent can cause problems. Refer to the claim as ‘water damage’. The policy owner must begin the processes or cleanup, drying out, and mitigation to prevent further damage if it can be done safely. Flooding is a high-pressure environment. Unscrupulous contractors may attempt to take advantage of the situation. It is important for policyholders to read and understand work authorization forms and beware of price gouging. The policyholder signs the forms, not the insurance company. The insurance company will likely pay for only ‘reasonable and necessary’ costs of cleanup and repair. The portion not paid by the insurance company is the responsibility of the person who signed the authorization forms. You may be able to avoid problems by adding language to the agreement that states the bill is subject to the agreement and approval from the insurance company. Having insurance company clout is a powerful ally. If you are dealing with a water damage insurance claim be sure to also see our top tips on insurance claims for water damages. The aftermath of a flood not only takes a physical and emotional toll on the victims, without flood insurance, but it can also be a financial disaster. Mortgage companies sometimes require flood insurance for homes in high-risk areas. There is a misconception that moderate to low-risk areas do not need flood insurance. Here are three things to keep in mind. • Flood insurance is not part of a typical homeowner insurance policy. • Flood insurance is not just for areas of high-risk. • Flooding is the Number One natural disaster in the U.S. Even if a mortgage company does not require flood insurance, it is needed for financial risks. All 50 states have been affected by floods. More than 20% of flood claims come from areas considered moderate to low-risk. An area with an abundance of snow can easily cause standing water in a basement when the snow melts in the spring. Extremely dry land may not absorb rain very well. Within a few hours, rainfall in drought areas can cause dangerous flash flooding that causes housing damage. Development areas can alter natural drainage that limits the amount of land that can absorb water from heavy rainfall. The water may end up in the location where you live. Tropical hurricanes and storms are often associated with flooding, even for those who live several miles inland. A stalled storm can wreak havoc by flooding areas where the ground is already saturated. Just because a flood has not affected you in the past, does not mean it can’t happen in the future. Flooding can occur anywhere. A few inches of water are capable of costing thousands of dollars. Storm surge, river-flow changes, flood control measures, and development may increase the level of risk in your area. 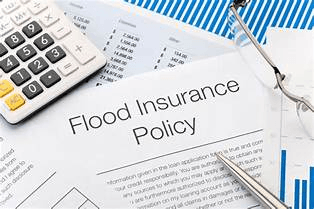 If you do not have flood insurance, it may be time for a policy update. Don’t wait until a forecast predicts flooding. There is typically a 30-day waiting period. 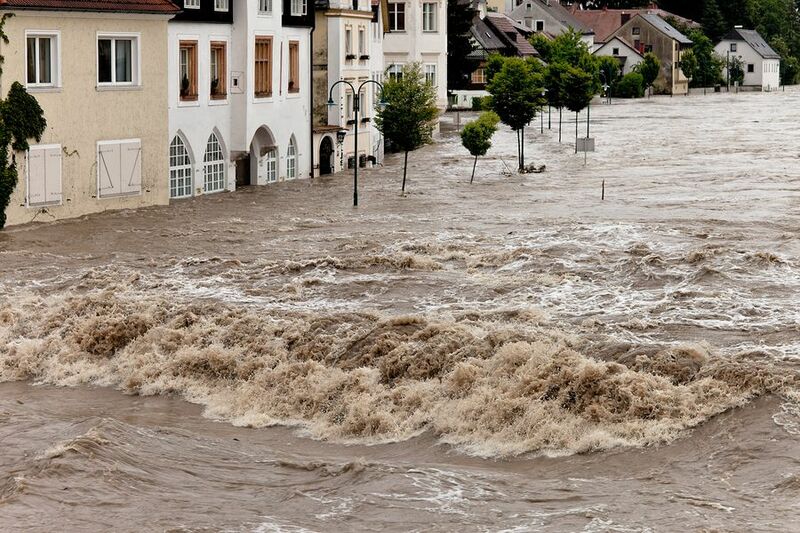 Here are some helpful questions to ask an insurance agent about flood insurance. • Ask if your community participates in the National Flood Insurance Program. NFIP flood insurance is available only in participating communities. Most communities participate. Your insurance agent will know if your state or city takes part in the program. • Ask in what flood zone you reside, and the flood risk of your property. • Ask if flood insurance is mandatory for your property. • Ask if you qualify for a Preferred Risk Policy. • If your community participates in the NFIP, ask if your home qualifies for a Community Rating System discount. • Find out how much coverage is needed for your building. Many belongings are generally not included in flood insurance and another policy is required to cover your possessions. Sewage backups are gross, expensive to clean up, and hazardous to your health. To make matters worse, they are typically not covered under a standard home insurance policy. Many people are unaware that they are responsible for maintenance of the sewer pipeline running between their house and the city’s sanitary sewer main that is usually under the street. Pipes that deteriorate can cause problems. Data from restorations companies indicate that the average cleanup and restoration costs of a basement damaged by sewer backup ranges from $5,000 to $20,000. All buildings that have plumbing are at risk of sewage backup. Old or historic neighborhoods, places that get heavy rain, or that are commonly flooded are particularly prone to sewage backup. Indications of a backup are waste or water coming up through drains in the basement or sinks. A standard home insurance policy does not typically cover sewage damage, but a sewage backup rider can usually be added to a homeowner insurance policy. The rider has a price tag of $40 to $160 per year, depending on the coverage needed and the deductible. Because the sewage line is underground, it can be very difficult to determine the likelihood of a sewage backup. Tree roots and shrubs are common blockage problems. They can cause extensive cracking and damage when they seep into pipeline joints. As shrubs and trees grow, the damage increases. Installing new plastic pipe to replace the line and tap can prevent roots from entering. A blockage in a city’s sanitary main can cause a backup. A qualified plumber can install a backwater valve that reduces the risk of a backup occurring. In the event of sewage water backup it is critical to respond quickly. The Insurance Information Institute recommends using a wet-dry vacuum to clean water-damaged areas and disinfect all walls and floors. Remove or steam clean damaged walls and wet carpet. If you have an insurance policy rider that covers sewage backup, take before and after pictures of all affected property and areas. Save receipts related to the sewage backup. Submit them to the insurance company soon after the work is complete. • It is not included in standard homeowner insurance policies. • It is fairly inexpensive. • No one is exempt from the possibility of sewage backup. • You qualify for Loss of Use coverage if the home is uninhabitable. In most cases, a failed sump pump does not make a home unlivable. Residents can live in the house while it is being cleaned and repaired. In some cases, a home is uninhabitable. Having sewage backup coverage qualifies the policyholder for Loss of Use coverage. Additional living expenses beyond the norm are covered as well as rent loss, as long as you have ALE (Additional Living Expenses) coverage. The cost of a hotel room is covered if the claim adjuster approves the Loss of Use claim. Water damage related insurance claims can be difficult to navigate, but it’s important to make sure you have the proper coverage for your property. Understanding your policy along with the best steps to take, should you need to file a claim, can make a monumental difference in the outcome and resolution.